Holidays are almost over and it is time to get ready to go back to school. Whether you have one or several children going to school, this time of year can be stressful mostly if you have a small budget. The bill can rapidly grow between school bags, notebooks, pens and new clothes. Here are some advice to prepare your kids to go back to school without spending too much money. Before even considering shopping for new supplies for school, take time to see what you already have at home. Does last year school bag can be used again this year? Do you still have pens, notebooks or folders from last year bulk buys? Once it is done, compare what you have with what is asked by the school and only buy what is missing. If a store sells a 1$ box of pens with a limit of four by purchase, buy the four in order to have enough supply for the school year and why not for the next one. Watch for sales and discounts to be sure to get the smallest price. A lot of stores also let you cumulate coupons and current discounts so do not hesitate to use them! The clothes asked by your children for this school year will certainly benefit from a discount in October. Wait, if you can, for sale clearance to equip your children head to toes while saving a lot of money. By spreading your shopping on several weeks or months, you can find the best prices. You can make use of flyers to find the best price in the shops around you but you can also shop online. A lot of websites such as Staples offers discounts and coupons only available online. Ebay or Amazon can also be a good place especially if you need to buy calculators or laptops. You can also find school supplies in surprising places such as hardware stores or thrift shops. It is garage sales season. You could find clothes, school bags or uniforms almost new for a very small price just around the corner of your home. You can also make your own garage sale in order to declutter your home and get rid of things you no longer use. Even if some purchase can be financially interesting, it is sometimes preferable to spend more money on higher quality items that will last longer. It is notably the case for school bags which can be used for several years. Do not hesitate to also buy visible supplies so that there is less chance that they get lost. It is also an easy way to differentiate your child’s supplies from his friends’. If your child wears a uniform, you know how expensive they are. What if you contact the parents of an older school friend to see if you could buy his or her uniform? You can also ask the school if they have uniforms that were forgotten last year or donated in order to buy it back. Some stores, for example Walmart, align on their competitors’ prices if they are cheaper than theirs. You just have to go to the store with the flyers of the other store and point to the product that is cheaper (it has to be the exact same product for this to work) and the store will most likely offer you the same price plus a special discount. If you need a lot of a certain product (tissues for instance), you can buy it in a store by respecting the maximum purchase amount allowed and then go buy it in another store which sells it at a higher price by using price match. Notebooks, agendas and folders with your kid’s favorite character or superhero printed on them are sold at a much higher price point than regular supplies. Buy a blank notebook (and the cheapest) and ask your children to decorate it according to their own test with images found online and printed at home, stickers, colorful masking tapes … Your children will express their creativity with unique supplies and make you save more than 50%. Your children don’t need to have everything. Before going shopping for school supplies, sit with them and make a list of things that are essentials and of things that can wait. It is also an occasion for you to give them financial education lessons. Give them the opportunity to help you out with the purchases by giving them a budget for school supplies. Explain to them that it is not always possible to buy everything they want. Doing this will prevent you from a tantrum in the middle of the shopping alleys and will allow you to better respect your budget. 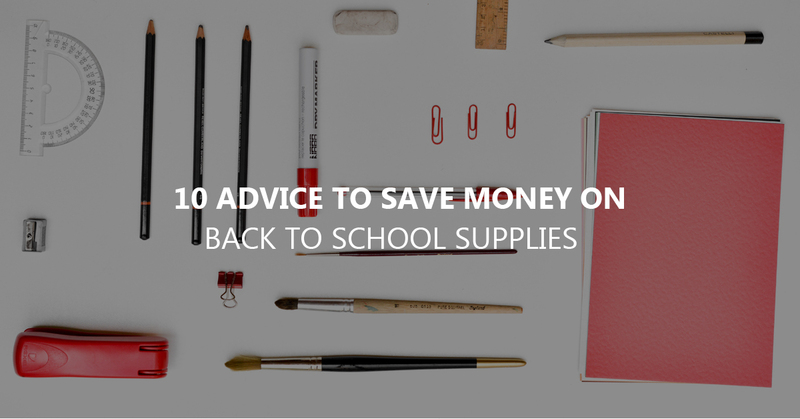 With a little organization, it is not necessary to spend $150 or more in school supplies. Anticipate, don’t rush and most of all compare the prices in order to respect your budget while pleasing your children.